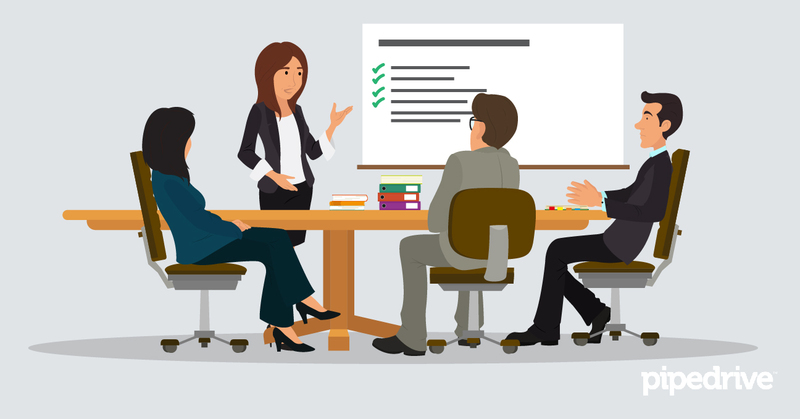 Meetings are an essential aspect of running a successful sales operation, but too often are thought of as necessary evils. There are numerous ways they can be sabotaged — there are no-shows, people spend the meeting twiddling their thumbs or on their phones, big talkers dole out too much, others spend time hiding and counting down the clock, and so on. Meetings have long been considered a curse in the business world, eating into an extraordinary amount of a company’s most valuable resource — time. The good news is: There are still ways to conduct productive sales meetings. Adopt the following tips and you’ll increase your chances of promoting your sales objectives in meetings. Just as importantly, you’ll also spend less time in meetings and more time selling. Productive sales meetings have a purpose. Can you identify your main desired outcome? Are you dealing with short-term or long-term sales objectives? Are you going to discuss the company’s latest sales reports? Are you enhancing your sales negotiation skills? Are you creating a sales contest? If it’s not important enough to create an agenda, is it important enough to attend a meeting? If you don’t have an agenda, then your meeting will probably just turn into a “conversation” where the most dominant people speak. Attendees (both required and optional attendees). Location (or alternative method of attending). One straightforward way to kick off a sales meeting is to encourage attendees to briefly share a success they’ve had since the last time the team met. This reinforces a sense of optimism. It also helps people feel like they’re part of the meeting, instead of just an observer. And if there are negative topics to cover, this puts any problems in a wider context. Who’s ready for some encouragement? People crave acknowledgement. Also, there’s more than just anecdotal evidence that recognizing good work and saying thank you is a great idea; research shows that when sales managers use praise, their employees are more productive overall. So if you’re leading a meeting, don’t miss an opportunity to motivate your team by letting them know they’re appreciated. Rein in the ramblers and ask them to keep their comments to a minimum. Beware of tangents that stray from the agenda — be ready to put tangents in their place. If a topic comes up that only relates to a few attendees, move it offline so that everyone’s time is respected. Balance the need for everyone to feel heard with the need to accomplish the goals of the meeting. If no matter how hard you try, you still can’t keep meetings on track and on time, there is a nuclear option: meetings at the end of the day. If you schedule a meeting, say, 20 minutes before your salespeople are supposed to knock off, this might be the saving grace that prevents them from straying off topic. OK people, who is doing what? Recap, recap, recap . . . before leaving the room. In a TED Talk, Jason Fried says: “Meetings are places to go to talk about things you're supposed to be doing later.” With that in mind, just before a meeting ends, make sure you agree what are each salesperson’s next steps. Ideally, these steps should be concretely linked to activity goals. Leaving the meeting, each salesperson should be clear about the decisions made and deadlines set during the meeting that impact their activities. How are we tracking decisions and outcomes of this meeting? You should check on the progress being made between meetings, either using a central checklist or process document. Because each salesperson’s objectives were properly defined in the first meeting, you now know the goals and deadlines to track. One of the key goals of tracking steps is to identify any roadblocks or other issues impeding progress — of individual salespeople, or the team-at-large — and address any problems that protects your overarching sales goals. To make sure your salespeople hit their activity goals, encourage them to use block logic to book slots in their calendars. Block logic allows salespeople to manage multiple demands and their time more effectively, to aid focus and achieve more. Pipedrive is all about productivity. Our sales management software helps you focus on the most vital parts of your business, so you can bring in more money, faster. But software alone can’t transform your salespeople into an efficient, effective sales team. In terms of meetings, it takes discipline and leadership to improve structure and order — and ultimately their quality. Incorporating the above tips into your sales meetings so they become habits is a strong step in the right direction to gaining control over your sales meetings. But whatever you do today, make sure you don’t let your salespeople or your company down by holding unnecessary, ineffective or inefficient sales meetings.